Wallaby!! 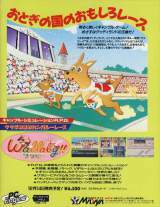 Usagi no Kuni no Kangaroo Race © 1990 Masaya. This game features Wallabies, kind of small kangaroos widely distributed across Australia. But here they are racing, and the goal of the game is to manage them and bet on winners. You will need a good knowledge of the japanese language to enjoy the game as the management side of the game requires to talk to other people. Released on December 14, 1990 in Japan for 6500 Yen.